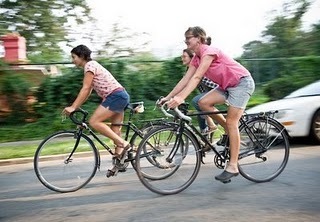 Last year Lara Sheets, 26, Liz Tylander, 25, and Kat Shiffler, 24, biked from Mount Pleasant to Montreal. Along the way they visited inner-city gardens, innovative suburban farms and rooftop vegetable plots as they chronicled a grass-roots movement seeking to change the way we put food on our table. The result is a low-budget documentary, "Garden Cycles Bike Tour," which captures the spirit of their unusual 2,000-mile sojourn and the much larger movement that inspired it. 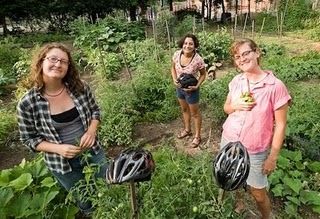 The trip has also generated a Web site and blog, http://womensgardencycles.wordpress.com. I was with Adrian Higgins of The Washington Post when he interviewed them for a story on this new trend. See the entire article by clicking on the title above.